The 2019 ITTF-Oceania Tour is here. With six stops across the continent and over AU$24,000 in prize money up for grabs, the ITTF-Oceania Tour is a new step forward for table tennis in the region. The ITTF-Oceania Tour is also the pathway to secure your ticket to the ITTF-Oceania Cup. Points won at tour events will directly affect the ITTF-Oceania Tour Standings, with the top eight athletes earning the right to compete at the 2020 ITTF-Oceania Cup. In 2019, athletes will need to compete in two 2019 ITTF-Oceania Tour events and earn enough points to qualify for the 2020 ITTF-Oceania Cup. 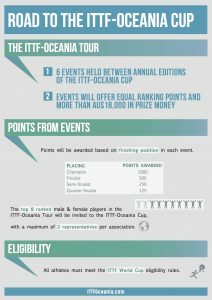 The 2019 ITTF-Oceania Tour regulations can be found here. The 2018 ITTF-Oceania Tour is here. With six stops across the continent and over AU$18,000 in prize money up for grabs, the ITTF-Oceania Tour is brand new step forward for table tennis in the region. The ITTF-Oceania Tour is also now the pathway to secure your ticket to the ITTF-Oceania Cup. Points won at tour events will directly affect the ITTF-Oceania Tour Standings, with the top eight athletes earning the right to compete at the 2019 ITTF-Oceania Cup. Check out the current ITTF-Oceania Tour Standings here.